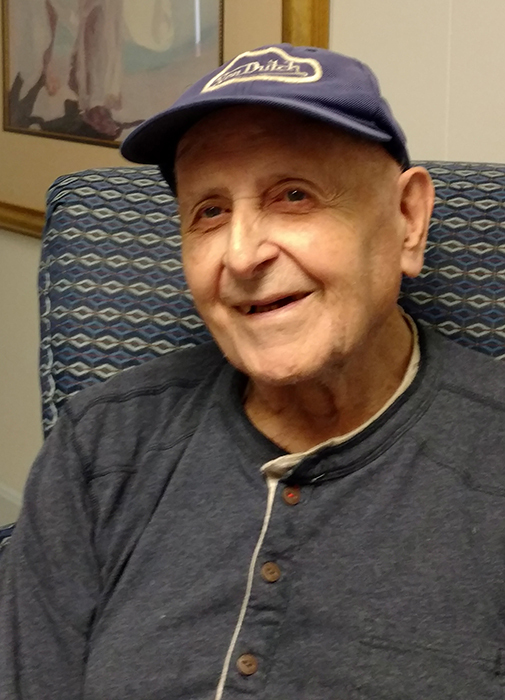 McPeak's Assisted Living resident Edwin John Weinmann will celebrate his 100th Birthday at the assisted living facility on Saturday, May 14. Born in Brooklyn in 1916, Mr. Weinmann, the only child of Augusta and Edwin Weinmann, spent most of his life in Ridgewood, Queens with his wife, Ann and daughter Marilyn. One of the ever-declining remaining members of the "Greatest Generation," Mr. Weinmann served as a munitions expert in the U.S. Army from 1942 to 1945 and received several Medals of Honor for his bravery during World War II. After being honorably discharged from service, Mr. Weinmann went to work for the Oxford Filing Supply Company, an office organization solutions company, today known as Pendaflex, based in Melville, New York. In the 1960s, he took a position closer to home, at Bohack's Supermarket, which was headquartered in Maspeth, Queens, where he worked until retirement. After that time, Mr. Weinmann became a doorman at an apartment house on 86th Street in Manhattan. Though he was loved by all of the building's tenants, Mr. Weinmann left his position in 1972, when he lost his wife. For 25 years after Mrs. Weinmann's passing, Mr. Weinmann visited her gravesite at Pinelawn Cemetary every Sunday, to bring her a bouquet of pink carnations. He'd come to know the florist so well that she continued to charge him the original 1972 price for his very special flowers. Though his beloved Ann passed away many years ago, Mr. Weinmann has never had any serious ailments and had not visited a doctor for more than 45 years before he moved in with his niece, Jennifer "Jennie" D'Amico in 2002, at the age of 86. He continued to live with his niece and her family for 10 years, first in Bethpage and then Patchogue, before moving in with his daughter. He was admitted to McPeak's Assisted Living in November 2014. Today, Mr. Weinmann, who shares a birth year with Kirk Douglas and Jackie Gleason, as well as the Professional Golf Association (PGA), Wrigley Field and the National Park service, lives a very happy and healthy life at Mc Peak's. He has a good appetite — especially for things such as mashed potatoes and ice cream — and loves to smoke his pipe or a good cigar and enjoys the occasional glass of red wine or Ballantine's Ale. He is a lifelong circus enthusiast and has a tremendous affection for all animals, especially dogs and horses. Mr. Weinmann will celebrate his 100th Birthday with 15 of his family members as well as his and fellow McPeak's residents. "He is truly a role model of the Greatest Generation," says Ms. D'Amico, who will be at his side on his big day.